The Food Security Platform will provide services and applications where the full power of Copernicus Sentinel-1 and -2 satellites as well as additional datasets are required. It will serve as a platform where users can easily access comprehensive satellite datasets in a timely manner and process these directly by using a range of available generic applications. 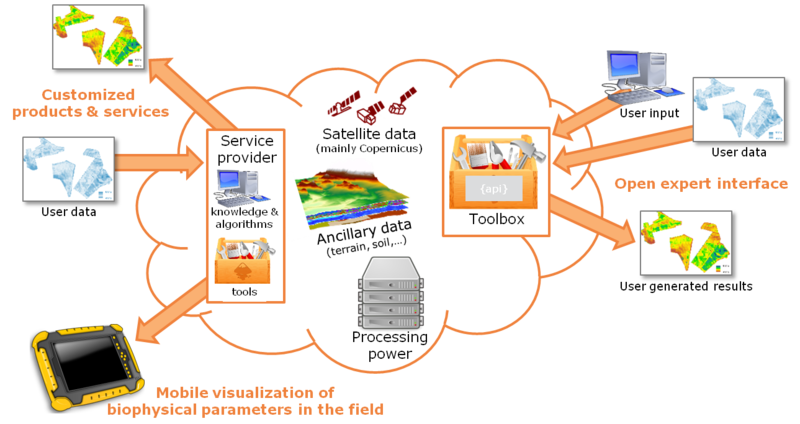 By providing a service to efficiently generate spatial information in a cloud and download resulting products, FS-TEP aligns with the paradigm shift of "bringing the users to the data" and thus enabling the processing of large datasets. A free and open interface for expert users will be the entry point to the comprehensive functionality of the platform including fast and easy access to satellite and ancillary data as well as the tools to explore, analyse and process these datasets. The Analyst View of the platform allowing the on-site visualization of EO information products and their time series via smartphone and desktop computer which is designed for easy and intuitive use. Customized products and services will provide additional, user-adapted information and interfaces for the monitoring and management of fish and agriculture farms as well as confidential data management in a secure environment. Please inform yourself about existing services in the Service Pilots section (to be filled soon).